Picking Purple and Golden Celosia. Photo courtesy of Tami Weiss. In the garden, winter is a season that rests while being very much alive. Leaves from the apple trees fall while calla lilies come up. We fill our slopes with overwintering flowers that will have us smiling through March. I am in need of rest too, if not also guided reflection. Growing food and working with the land is transforming my ideas about what both my body and spirit are capable of. In April of last year, I moved to a thirty-acre farm in Santa Cruz, CA, to learn to grow organic vegetables, flowers, and fruit trees. Learning to farm and garden holds an endless set of requirements for patience. What is not lost on me is what comes with a commitment to trust the natural world as much as our constructed, human world. That trust empowers me to see myself as a black woman both caring for and cared by the land. Every day begins with my body and I am struck by the intimacy of this bodily work. How physically rewarding it is to willfully exhaust myself in the name of living abundance. Every day, I experience the garden as an expression of a relationship in which my body is a nurturing force. Sometimes I think I garden as an ode to all of my muscles. I thought I knew my body, though I am finding that my relationship with myself evolves even in the realms we thought had been already settled upon. I am finding that the hills of the garden (oh, to cultivate among the slopes) have great plans for me. I am learning to trust my limbs more, to accept when they give out on me, to seek the fast, digging days as much as the slow, rainy days spent sowing under the comfort of the greenhouses. But comfort is often fleeting. The garden reminds me of that and also holds me when those reminders flood in from elsewhere. Seasonality, as I am experiencing it, is primarily a metaphor for grief. There are humbling ways in which the natural world pushes me to embrace our mortality. I am baffled that we can repeatedly experience an abstract time of year beyond the people that leave us or are taken from us in any specific season or month. Grief is always there, but so is the land. It is there when I need to hide under the canopy of trees, away from any one of my states of being. There when I mourn the loss of the black woman who raised me and can’t help but wish she could have died in her sleep while nested between deep banks of calendula, comfrey, and flowering oxalis. There upon receiving the news that a dear friend was literally dumped at the bottom of an underpass in New York City and left for dead. There grieving Lyric’s death while descending so desperately into the garden that I was wiping my tears with soil. Transporting winter flowers. Photo courtesy of Dorian Payan. Growing food on this land is teaching me about human intimacy and feeling, too. How we can tire together, seek together, and bask in our shared harvest. How we all have a role. 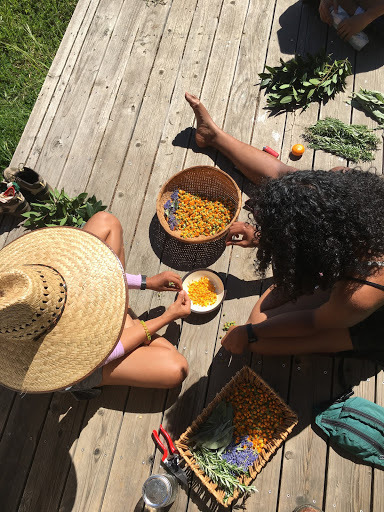 Here as an apprentice, our learning takes place in spaces that we know hold a deep intimacy: our tent-cabins, a shared kitchen that feeds fifty, the gardens and fields themselves. Doing this work ironically has many hiding places yet nowhere to hide. Our visibility in this way fuels our vulnerability. I have had moments—many of them—where I have heard myself express things to the people around me so void of care and empathy, and then had no choice but to experience the shame of my own words in the same company. But as adrienne marée brown would have me remember, “When I am vulnerable, I feel most alive.” I hope to never lose the truth of her words. My past selves are not distant memory but I can say that I am grateful for the opportunity to do work that demands so much of my heart every day. adrienne marée brown also speaks often about the power of iterative work, how small and consistent interactions can be critical pieces of what we are capable of building together. I look no further than my work here on the farm and in the gardens, where there is never a shortage of tasks. Our tasks find us laughing, celebrating, exhausted, and sulking. We do many of these things together, some on our own. I can only speak for myself when I say that I rely on the intimacy tucked into these moments. Of course, there is the romance of my relationships here; and then there is the romance of the land itself. When you work on a farm, you experience and cultivate a beauty that filters into everything: the ocean past noon when the fog clears; the flush of green across the hills in late November after the first heavy rains of the season; light purple Lisianthus and pale yellow Dianthus flowers which give new meaning to the carnations family; an appreciation and lusty affair for old English roses, how heat activates their scent when the sun is highest; hummingbirds chasing after each other; watching deer mate from the side of the road; the feeling of being absolutely adorned in green leaves, shielded in a way from the pain of what lies beyond the garden’s gates; the way day and night re-introduce themselves to each other over and over again, without fail. Lemons. Photo courtesy of Dorian Payan. Perhaps one of my greatest takeaways has been a newfound and literal appreciation for the color brown. Believe it or not, it was a best friend of mine in the eighth grade that told me not to wear the color brown again. It made me look naked, she said. I went home that day and tore off the fitted brown shirt I had bought myself on a Friday evening with money I had made from a babysitting job. I felt as naked and ugly then as I did earlier at school that day. The next time I remember wearing a brown shirt was at twenty-three years old. And even so many years later, I still think of that friend and the power her words had (and may still have) over me. So when I say that the literal brown ground is teaching me about beauty – lush, dense, barren-not, and far more alive than I think I’ll ever be – it is like having the color returned to my face. This California soil, fifty-one years in the making and whose health is made possible by more living things than I could even begin to imagine, is primarily a teaching in reverence. How you can bend down to reach your hands into the soil to realize that you are bowing. How you can shake excess soil off of root vegetables in the dead of winter and realize your movements are a thank you prayer. Stewarding the land can be a mirror, which I need for my daily reminders to stay hydrated, fed, rested. I rely on nature’s needs to understand and maintain my own. Let us consider my hair. If my 4C curls reach the small of my back, it will be because the garden led me there. Because the garden reminded me to check for dry down; to apply moisture with care; not to fear water and to understand that my not heeding that warning could be my scalp’s downfall. I laugh that I am far better at moisturizing my hair these days. The garden is the friend I needed as the sole black girl in my graduating high school class, who could have told me to use the hallways as a runway, wearing that beautiful and simple brown shirt, and running my fingers through my own curls. I fear the day when I choose to leave this farm and these gardens. The scene that looms is finding myself back home, wherever that is, like that fateful day in middle school, trying to erase any indication of myself. What I’m trying to admit is that I’m afraid we can grow to love ourselves and then backslide so far into the idea that we are undeserving, unpretty, hideous. I wonder if self-love is sometimes conditional. But the earth has taught and loved me well, and I am reminded that my unpretty moments are the ones when the garden is the first friend to come over and the last one to leave; when I am less concerned with what looking at me is like; less concerned in general; not as worried about feeling loved as I am at a loss of what to do with all the love I do experience. So much beauty and I am just learning to touch it with my hands. Follow Makshya on Instagram at @processdaily or send an e-mail to tolbert.makshya@gmail.com.